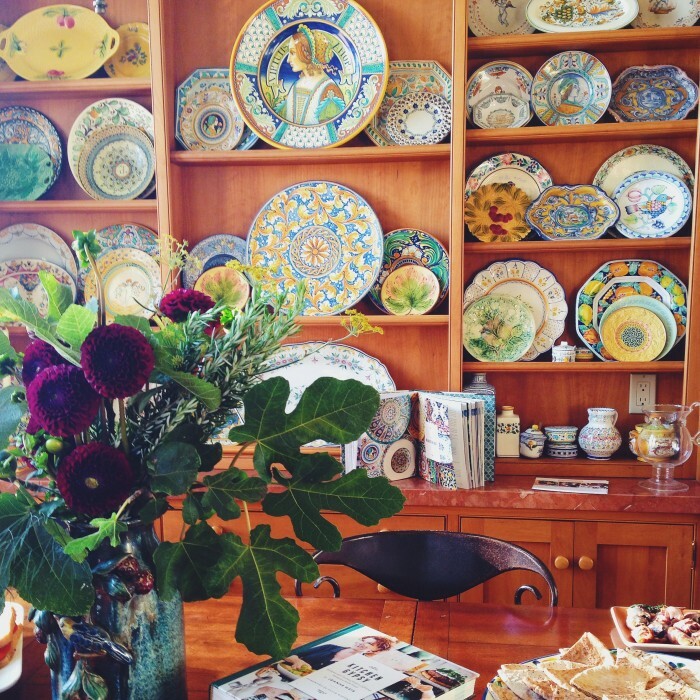 Earlier this month, I went to a beautiful dinner at Joanne Weir’s home in celebration of her new cookbook, Kitchen Gypsy. 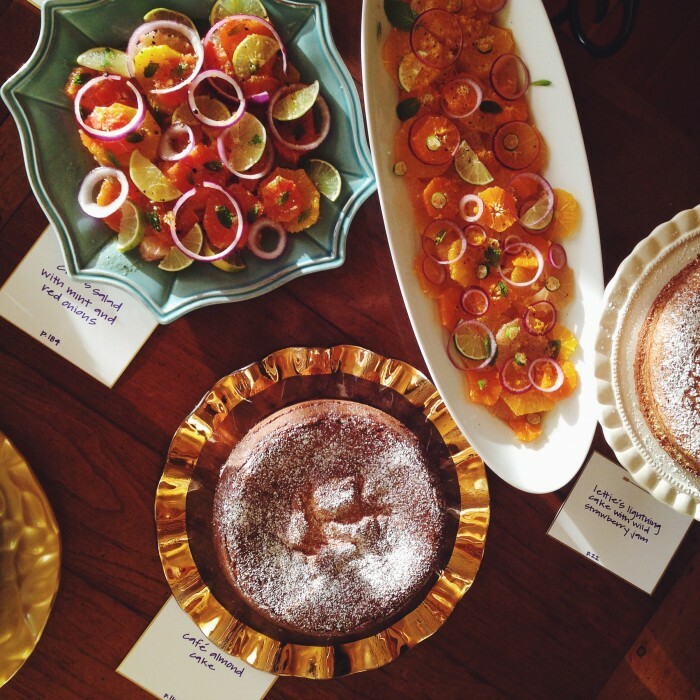 It was a potluck, a genius idea that put a whole array of recipes from the book in front of us and had the added benefit of letting Joanne witness people cooking from her book—which is, of course, the goal of most cookbooks but an act rarely observed by their authors. Joanne regaled us with stories and made a few recipes on the spot, including a killer chocolate milk shake spiked with chile powder and tequila that I will soon replicate in my own kitchen. She was in her element, teaching favorite recipes and encouraging home cooks. As their feet hit the top of the steps, several guests were voicing their concern about the correctness of their salad dressing, or how terrifying it felt to cook Joanne Weir’s recipes for Joanne Weir herself—perhaps not realizing that, if I’ve read her right, these happen to be the very fears Joanne lives to alleviate. She praised food and remembered names left and right, a charming hostess. The evening was gorgeous, sun streaming through the windows as we sipped wine and filled our bellies and made connections with strangers-turned-friends. It was quite dreamy indeed. As for the stories, I am, perhaps, most enamored with the one she tells about her first trip to France. She’s in her early twenties, settling into a new apartment with a friend, and upon finishing a bottle of wine together, she discovers a fly that had been bottled up with the wine. And so she wraps it in a piece of foil and sends it to the winemaker along with a letter of complaint. The extremely prestigious French winery respond with an apology, mentioning that if she’s ever in the neighborhood, they would love to offer a meal to her and a guest. So she goes—to France!—along with her roommate, and they have a life-altering meal at the winery, complete with gorgeous Frenchmen and Diane von Furstenberg wrap dresses and a copious amount of wine. It’s early-twenties living at its finest, a subject I adore. But I’m also pretty smitten with Joanne’s tales of her time at Chez Panisse, when the California food revolution was in its infancy and she chatted regularly with Alice Waters and cooked alongside such beloved figures as David Tanis and David Lebovitz. Ruth Reichl speaks to the fascination of we the (food-obsessed) millennials with this particular moment in history in a recent article in the Times. It’s true. But how can we not be transfixed? To imagine being there for those crucial moments—driving them, in fact!—long before it was even clear that this was a movement, before anyone knew that there were jobs in food beyond chef, restauranteur and critic, before it was ultra-trendy to work in food. I so admire the people who stepped into this work, not knowing what the outcome would be but believing so strongly in good, thoughtful, well-sourced food that they chose this path for the simple purpose of pursuing and sharing what they believed in and loved. 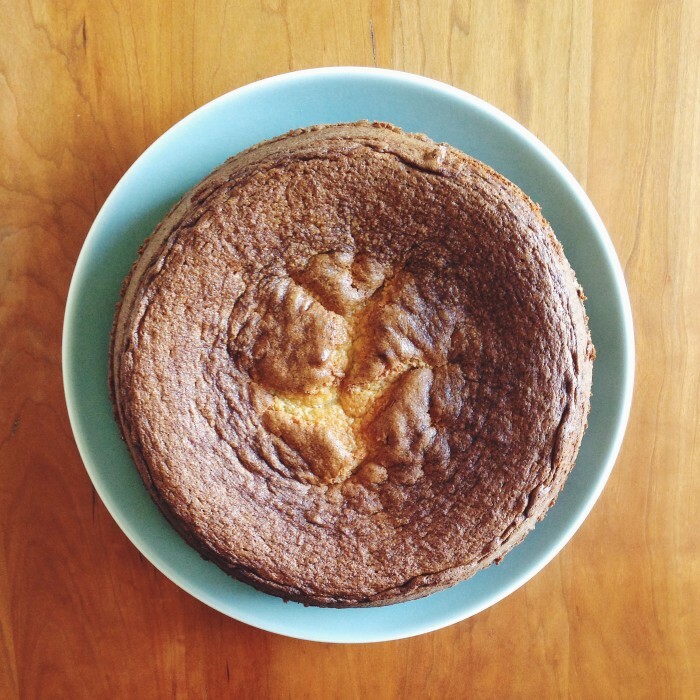 In that section, Joanne shares a recipe for an almond cake that perfectly exemplifies the wonder that is Chez Panisse: it’s absolutely simple and profoundly delicious. I love it for dessert, paired with afternoon coffee or eaten in thin slices late at night. Many heartfelt thanks to Joanne Weir, Sunset Magazine and the ladies at Dadascope Communication for including me in this lovely celebration! I was a guest without obligations, and all opinions here are my own. If you know me, you will know that this is my sort of cake. I’ve watched many people pass such cakes by, in shops and cookbooks, what with the lack of flashiness and all, but I can spot a winner like this from miles away, and it was calling my name the first time I flipped through this book. As with the best simple cakes, this one will serve you well at breakfast, during tea or after dinner. And it’s not only simple in form and looks but also in preparation, about as easy as these things get, thanks to the power of the food processor. Preheat the oven to 325 degrees. Butter a 9-inch round springform pan, then dust the pan with flour, tapping out the excess. In a food processor, combine the granulated sugar and the almond paste, processing until well mixed. Add the butter and process until light and fluffy. With the food processor running, add the eggs, one at a time, processing after each addition until fully incorporated. Add the flour mixture and process one more time, just until thoroughly blended. Pour the batter into the prepared pan. Gently smack the pan against the counter to knock out any air bubbles. Bake the cake until a toothpick inserted in the center comes out clean and the center feels springy when gently pressed with your finger, 1 to 1 1/4 hours. Let the cake cool in the pan on a cooling rack for about 20 minutes. Run a thin knife blade along the inside edge of the pan to loosen the cake, then unclasp the latch and remove the rim. With a wide metal spatula, carefully slide the cake onto the rack and let cool completely. Transfer the cake to a cake plate or stand and dust the top with powdered sugar. Stacy, You brought tears to this Kitchen Gypsy’s eyes! Thanks for such a thoughtful piece! 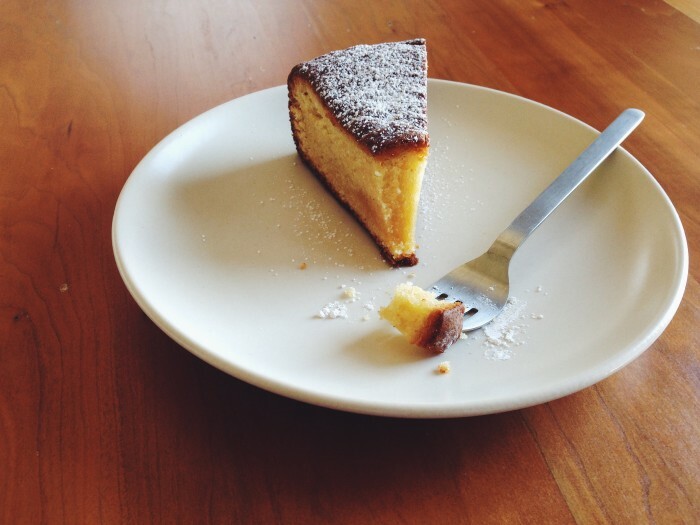 Almond paste in an “absolutely simple and profoundly delicious” cake with a cup of good coffee. Now we’re talking.